Cincinnati city is situated on the shores of Ohio River, which is surrounded by the beautiful hills. The city has earned “Pearl of the West” and “Queen City” names for its beauty. It is one of biggest industrial cities in the United States and has ample of cultural & recreational facilities. Look for low cost flights to Cincinnati to explore the ancient history and architecture of the city within your budget. The Cincinnati city’s culture is highly influenced by Irish and German immigrants. The cuisines in the city reflect the German heritage. Most of the restaurants are specialized in Bavarian cooking and schnitzels. 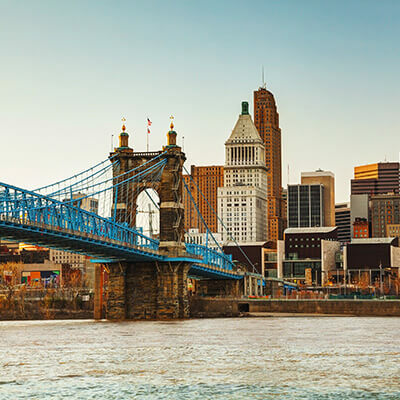 There are ample of events and festivals happen all throughout the year that include Oktoberfest Zinzinnati, Cincinnati May Festival, Bockfest, MidPoint Music Festival, Taste of Cincinnati and lot more. Check for Cheap flights to Cincinnati to visit the spectacular events and enjoy the most. The zoo is famous for gorillas and white Bengal tigers. The Cincinnati zoo has one of the world’s largest insectariums. It also has 4 – D theater and various rides for kids. During some days of the year, the zoo organizes animal encounters shows for the general public. The museum is located in the Eden garden and features amazing art work that include ceramics, sculpture and pictures from great civilizations. The museum hosts many permanent and temporary both national and international exhibitions throughout the year. The wide collection in museum includes European and American painting & sculpture, African art, Far East art, Decorative Arts, photographs and textiles. Cheap Domestic Flights can be booked to explore the great art works. The world renowned museum in Cincinnati is designed in a royal looking Palladian style building. The museum has stunning collection of European Decorative Arts, paintings from Old Masters, sculptures, and furniture among lots of other pieces. There are many other fascinating places in Cincinnati to explore which are Cincinnati Museum Center, fountain square, Carew Tower & Observation Deck, American Sign Museum, Irwin M. Krohn conservatory, Music Hall and many other great places to visit. You can book your cheap flights to Cincinnati during anytime of the year. The international airport of Cincinnati, Cincinnati/Northern Kentucky International Airport has well connectivity to major destinations in the United States and across the globe. If you are looking for cheap plane tickets to Cincinnati, then Lookupfare is the perfect place for you to book your flight tickets. Make your travel hassle free to Cincinnati; you should get the best Cincinnati flight deals through Lookupfare.